Among sharks, the white shark (Carcharodon carcharias) represents the archetypal shark-the flagship of the ultimate predators of the ocean. But despite being the most featured shark of them all, a lot of information within the mainstream media is incorrect. This workshop shows and discusses the true nature of white sharks, debunking the myth of “Jaws.” Beside general topics about their biology, more in-depth subjects like hunting strategies, incidents with humans, true reasons for “breaching” and others will be discussed, as well. This workshop is tailored to people who like to observe white sharks in their natural environment and learn about their life at the same time. Beside white and bull sharks, tiger sharks (Galeocerdo cuvier) belong to the three most feared shark species. That neither one is indeed dangerous will be shown in this workshop as well as discussed why e.g. tiger sharks are the often mentioned “trash eaters of the sea” and what it really means when non-digestible items are found in their stomachs more than in any other species, or why they have such uniquely formed teeth and so on. 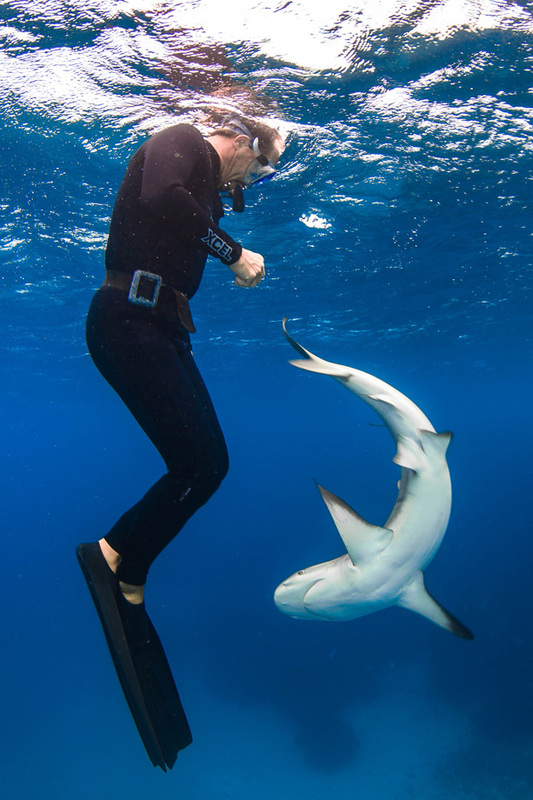 The core element of this workshop however is to dive with these sharks, to learn their behavior up close and personal and interact with tiger sharks on a truly personal basis. Another shark species always present at the main dive site are lemon sharks (Negaprion brevirostris)-the smiling sharks. Tigers and lemons create a unique blend of diving with more than one species at the time, making each encounter count. 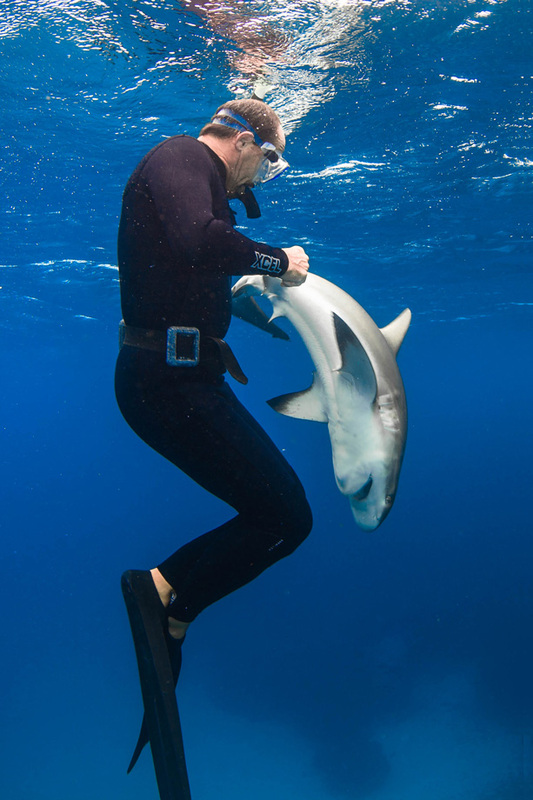 Since the sinking of the battleship USS Indianapolis on July 30, 1945 where many sailors supposedly fell victims to the oceanic whitetip shark (Carcharhinus longimanus) is this species named as one of the most dangerous shark of them all. And it does not matter that this or any of the other top species commonly involved in incidents, is indeed dangerous, and that it always is the situations created by men that leads to these incidents. Once a shark species has been branded as ‘dangerous’, this attribute sticks. And this workshop tries to remove this label at least from this one species. One advantage when dealing with Oceanics is their low threshold to approach divers, free divers and swimmers, offering a unique platform to compare theory and practice. Beside Oceanics, pelagic thresher sharks (Alopias pelagicus) is another species where myth and knowledge clash, and each participants will spend some time with this incredibly elegant species, as well. Beside these two species, the grey reef sharks (Carcharhinus amblyrhynchos) will round up this heterogenic group of oceanic and reef species. Many divers see hammerheads as the most beautiful sharks off them all. Their uniquely shaped head, the cephalofoil, is the base of several topics during the lectures. Cocos island is probably the best places in the world to dive and interact with these unique sharks. These sharks approach so close that even eye color can be identified, they also offer a good insight into approach patterns and schooling. The hammerhead species encountered around the Cocos islands is the scalloped hammerheard (Sphyrna lewini) but the workshop will also dive into other species, like e.g. the great hammerhead, S. mokarran, too. Although hammerheads are the prominent species around Cocos other shark species are plenty as well, e.g., Galapagos sharks, Carcharhinus galapagensis, silkies, C. falciformis, whitetips, Rhizoprionodon terranovae, or tiger sharks, Galeocerdo cuvier.